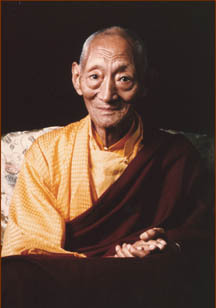 Kyabje Dorje Chang Kalu Rinpoche was an enlightened being and the spiritual founder of KDC. He was a great siddha, scholar, and a mountain Yogi from Tibet whose great compassion and realization transformed all who met him. Guru Yoga is a practice of expressing one’s faith and devotion to one’s Root Lama. In the Vajrayana tradition, Guru Yoga Practice is considered to be the most important practice one can perform. Without faith and devotion to the Root Lama, one is not able to receive blessings. Blessings purify one and create the foundation for understanding the nature of one’s mind. At the request of his students, Kalu Rinpoche wrote the Guru Yoga Practice, “A Rainfall of Blessings.” It is a practice that is short, easy to understand and perform; however, it is very profound. The cost, which includes the Pecha, is $35 ($30 KDC members). Schedule: 9:00 -11:30 a.m.: Instructions and guided meditation. 1:00 – 4:00 p.m.: Question-and-answer period and guided meditation. You are welcome to bring a lunch and stay during the break.